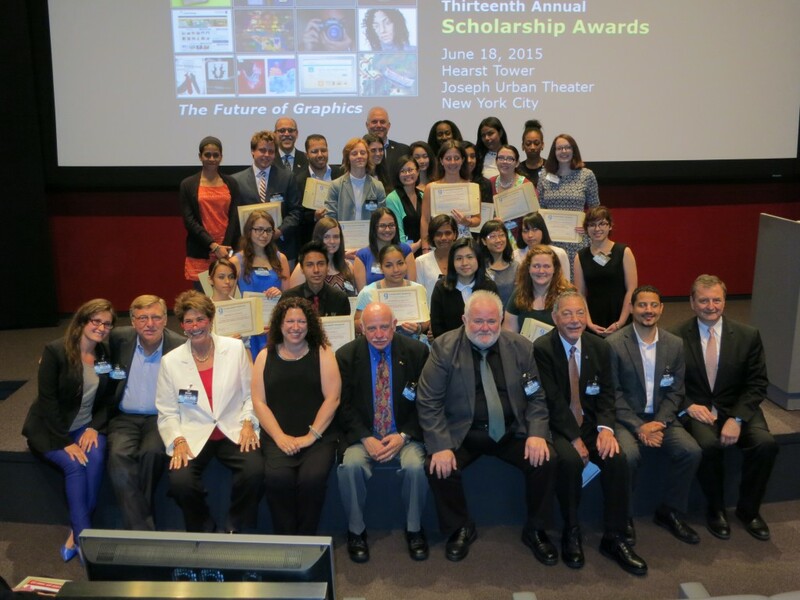 Bright smiles for bright futures at GCSF’s 14th annual scholarship awards ceremony on June 23. What does an educational fundraising organization do for an encore? The answer is easy: raise more money for education. Considerably more difficult is achieving a 50% year-over-year increase in scholarship funds distributed. But this year, that is precisely the philanthropic coup that the Graphic Communications Scholarship Foundation (GCSF) has managed to bring off. The money—all $160,500 of it—is now in the deserving hands of 41 New York City metro area students pursuing undergraduate and graduate degrees at 16 schools offering programs in graphic design, production, and publishing. 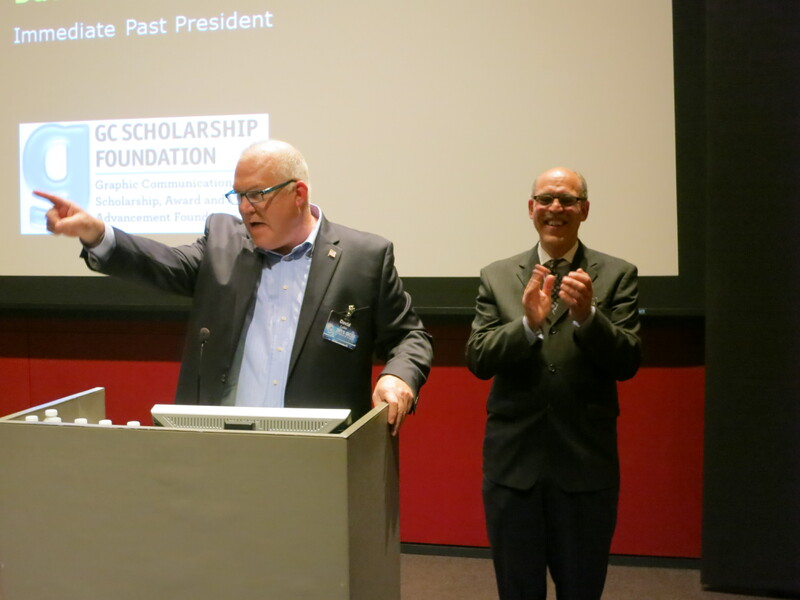 More than half of the record number are repeat recipients, and the group as a whole nearly overflowed the stage at the Hearst Tower Atrium during the 14th annual GCSF award ceremony on June 23. The sum of the 2016 awards easily outstrips last year’s record-setting amount and is a far cry from the $5,000 worth of stipends that GCSF presented for the first time in 2002. Since then, a total of more than $686,000 has been disbursed to 149 recipients. The grants come from an inventory of separately endowed scholarships that GCSF, a 501(c)(3) organization, coordinates and helps to raise money for. Students, who earn the awards by submitting portfolios, letters of recommendation, and supporting essays, may continue to apply for and receive them until they graduate. Over the years, the GCSF scholarship program has become a focal point for educational giving by graphics industry trade groups in the metro area. The most munificent of givers in 2016 has been the Advertising Production Club of New York (APCNY), which raised about $100,000 of the total presented on June 23. Other stalwart organizational supporters include IDEAlliance, Printing Industries Alliance, and The Navigators. Voluntarism in its purest form remains the cornerstone of everything that GCSF does. Its officers, who are uncompensated, work without professional staff or dedicated office space. This means that the program has virtually no overhead expenses—all of the money collected passes through to the students as stipends. It has been done this way from the first time GCSF’s founding members sat down in a borrowed conference room to discuss how to revive a small number of print industry scholarship funds that were not being actively managed. Many more scholarship endowments have come under GCSF’s custodianship since then, but the group’s insistence on channeling 100% of their proceeds to students has not changed. GCSF sustains the financial assistance it provides by drawing upon a dependable network of individual donors and corporate sponsors (see table below). The generosity of this network was evident at the group’s “Spring Fling” event on June 15, a fundraising-focused social gathering hosted by Ogilvy & Mather on the rooftop of its building overlooking the U.S.S. Intrepid on the lower Hudson River. 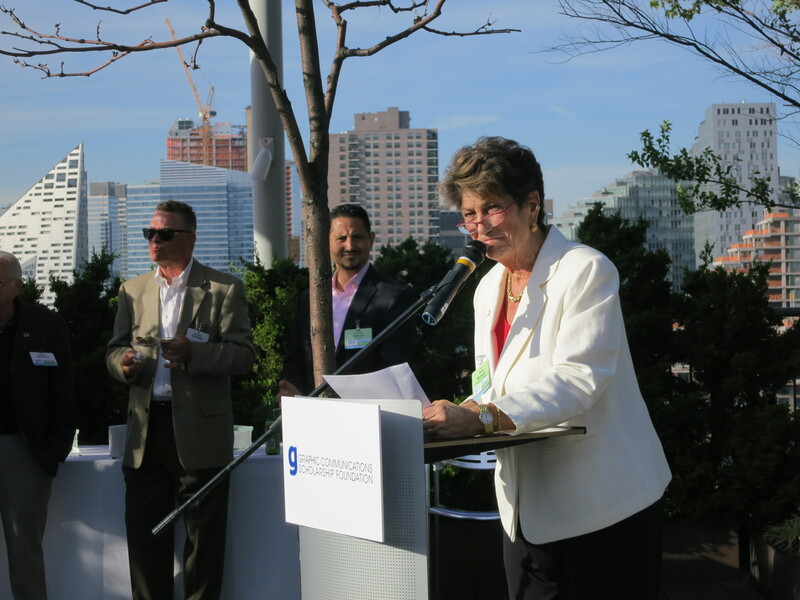 GCSF vice president Diane Romano emcees the group’s “Spring Fling” fundraiser on Ogilvy & Mather’s rooftop. Nearly 200 printing, publishing, and media professionals attended, and 35 high-profile corporate supporters pitched in. The result: a net of $30,000 to help swell the bounty distributed at the awards ceremony on June 23. Fundraising isn’t GCSF’s only outreach on behalf of graphics education. It also operates a mentoring program that pairs metro area students with seasoned members of the industry for 12 months of enhanced, hands-on learning experiences in real-world business settings. In this way, students gain both the practical knowledge and the personal confidence they will need for success in their chosen fields. GCSF also arranges internships and solicits contributions of training aids and educational materials for use in graphic studies programs. Mentees and mentors, from left: Jack Kott, Valerie Buonaiuto, David Luke, Lea Orsini, Allyson Gonzalez, Emilia Dabrowska, Roxana Santana, Nick Patrissi, Jessie Ann Murphy, and Jerry Mandelbaum. Everything culminates in the annual scholarship awards ceremony, held for the last nine years at the Hearst Tower Atrium. Student testimonials and the bestowal of a special educational honor highlight the value of GCSF’s work, the difference it makes in the lives of the students on whose behalf it is done, and the solidarity of the industry that stands behind it. First-time recipient Sergio Georghiou, a freshman at SUNY Purchase and the creator of the winning portfolio in a citywide graphics competition, spoke with unrestrained emotion about his family’s faith in his talent through difficult times. “This award is for them,” he said. Valerie Buonaiuto (Adelphi) talked about the personal growth she experienced by taking part in the mentoring program and completing a GCSF-arranged internship. 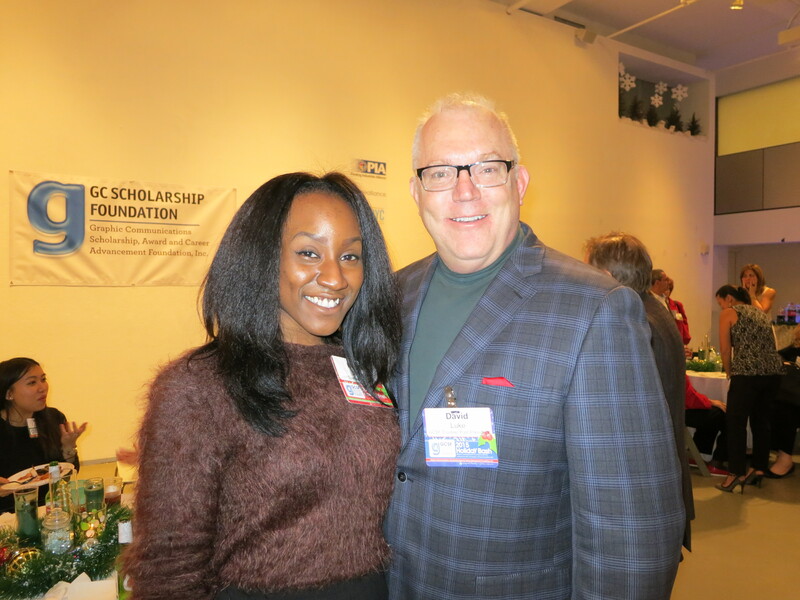 Natalie Alcide, on her sixth GCSF scholarship grant as she nears graduation from New York City College of Technology, said simply, “I wouldn’t be the woman I am today” without the help she received from GCSF members who encouraged her along the way. Since 2008, GCSF has saluted industry members with exceptional records of providing this kind of help as its “Champions of Education.” The 2016 honoree is James (Jimmy) Levin, an award-winning commercial photographer who went on to become a leading specialist in media recruitment and staffing. Today he operates Job Search Therapy, a consultancy for job and internship seekers. Levin sits on GCSF’s scholarship selection committee and is a board member and the education committee chairman of APCNY. 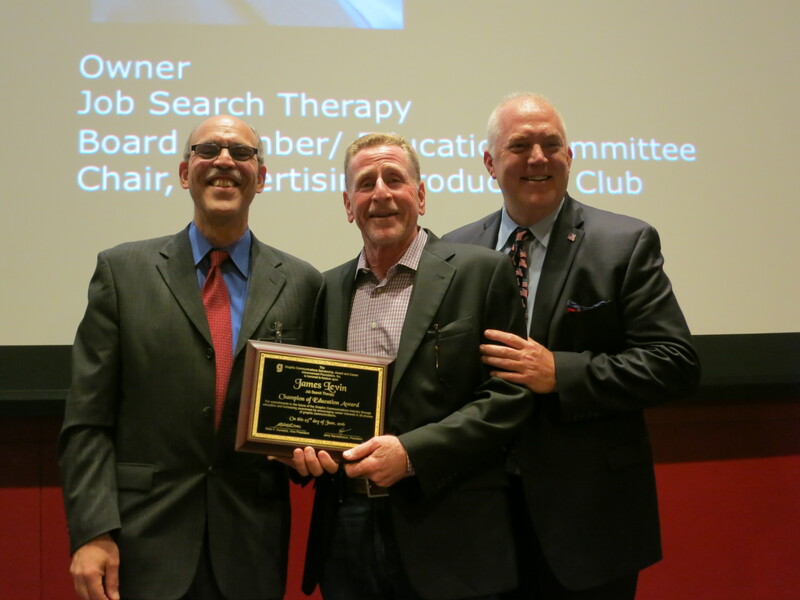 James (Jimmy) Levin accepts the 2016 Champion of Education Award from GCSF president Jerry Mandelbaum and past president David Luke. Accepting the Champion of Education award, he urged students to develop their potential “with passion and purpose”: always challenging themselves, but always focusing their energies on pursuits they enjoy and believe in. Levin also reminded them that “attitude and effort” are two things in life that professionals can always control, even when other forces seem to be slipping from their grasp. 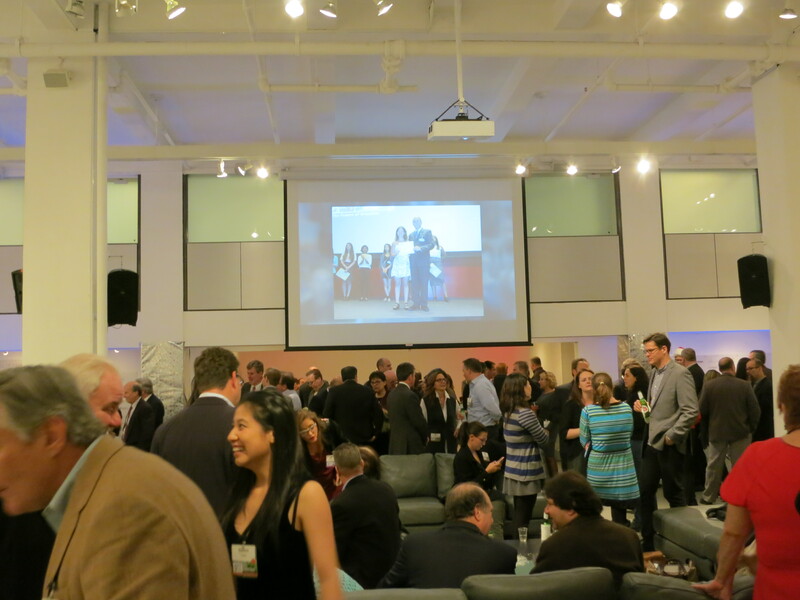 Many of the people who attended GCSF’s Spring Fling and scholarship award ceremony will also be on hand for another gala event that celebrates professionalism in graphic communications: the 2016 Franklin Luminaire Awards, to be co-hosted by Printing Industries Alliance and IDEAlliance on October 19 at The Lighthouse at Chelsea Piers. PIAlliance and IDEAlliance’s DEER Foundation donate most of the net proceeds from Franklin Luminaire to GCSF. GCSF’s next gathering will be its fundraising “Holiday Bash” on December 8 at a location to be announced. What’s the best way to raise $10,000 in a few hours for a worthy cause? Throw a party. But the cause needs to be the Graphic Communications Scholarship Foundation (GCSF), and the party needs to have been the well-attended affair that the foundation hosted at the Manhattan headquarters of the Art Directors Club on December 10. The money collected from admissions and sponsorships, 100% of which goes to fund scholarships, was on top of the $100,000+ in grants that GCSF presented to 31 students at its annual award ceremony earlier this year. The foundation, an all-volunteer 501(c)3 corporation, has been doing this kind of good work on behalf students of graphic communications in the metro area for 13 years. Along the way, its mission created a focal point for educational giving by other graphics industry groups and clubs throughout the area. Their donations help to fund the various scholarships that GCSF administers and presents, and their members show their support personally by turning out in force for the GCSF “spring fling” and “holiday bash” events that have become highlights of the industry’s social calendar. GCSF’s principal partners are IDEAlliance, the Advertising Production Club of New York (APC-NYC), the Art Directors Club, The Navigators, and Printing Industries Alliance (PIA). On December 10, nearly 200 of their members gathered in space donated by the Art Directors Club for a celebration of the year’s accomplishments. Also on hand were those who helped GCSF make the bash possible: individual sponsors and representatives of companies that furnished sponsorship contributions and raffle prizes (see lists below). But, the evening’s real celebrities were the 12 students who came as GCSF’s special guests. They are among the 131 students to whom GCSF has made $526,000 in scholarship grants since its founding in 2002. Like their predecessors, they are graduates of graphic studies programs at metro area high schools who are pursuing academic degrees at leading colleges and universities where the discipline is taught. They earned their stipends by submitting academic records and creative portfolios for evaluation by GCSF. 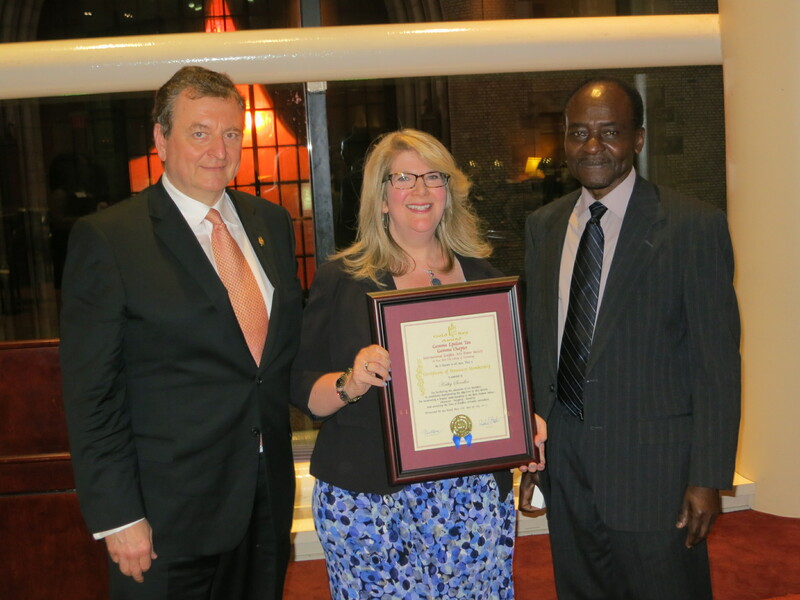 One of them was Natalie Alcide, who delivered a short keynote thanking GCSF and its supporters. Now a junior at New York City College of Technology (City Tech), she is in her fifth year of receiving scholarship grants from the foundation. If she enters a graduate-level graphic studies program, she can go on receiving them for a total of eight years. Alcide’s career ambition is to win an art director’s spot at an advertising agency. She said that as helpful toward that goal as the scholarship funding has been the experience of learning from industry professionals through internship and mentoring opportunities provided by GCSF. Watch this blog for further news of GCSF activities, including its 2016 scholarship awards ceremony when the details of the event are announced. In the meantime, please consider spreading holiday cheer and helping graphics education by purchasing holiday cards and posters created by student recipients of GCSF scholarships. GCSF officers, trustees, and scholarship recipients, back row, from left: John Aaron, David Luke, Jerry Mandelbaum, Diane Romano, Natalie Alcide (recipient), David Garcia, Mark Darlow. Front row: Jack Kott, Ellen Hurwitch, Richard Krasner, Jessie Ann Murphy (trustee and recipient), Nick Patrissi, Valerie Buonaiuto (recipient). 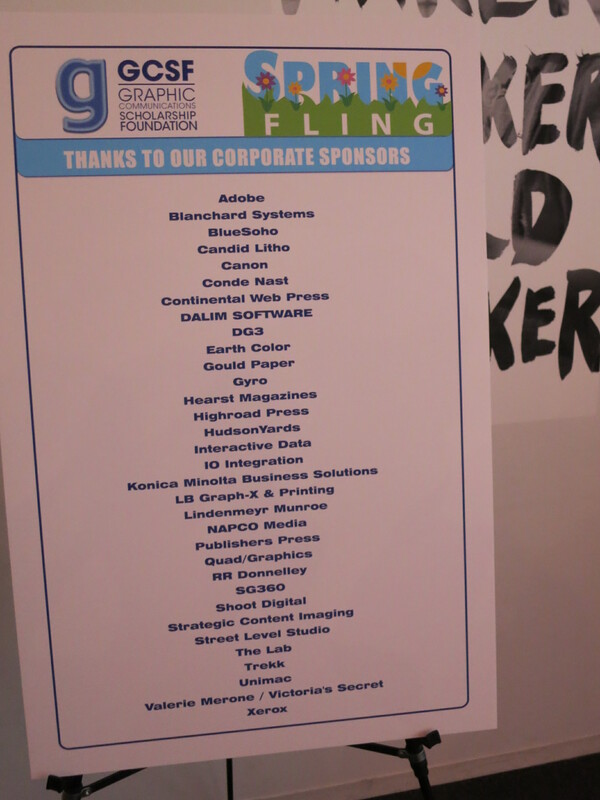 The GCSF holiday bash sponsors included Blanchard Systems; Buy-Rite Robbinsville; Candid Litho/ Candid Worldwide; Canon; DALIM Software; Thomas Saggiomo, dg3; Hearst Magazines; HudsonYards; Konica Minolta Business Solutions; LB Graph-X & Printing; Mark Darlow, Graphic Art Supply; Robert S. Rosenbaum; RR Donnelley; Unimac Graphics; Valerie Merone, Victoria’s Secret; and Xerox. The raffle gift donors were Canon; Pantone; Adobe; DALIM, Bricco Ristorante Italiano, Christine Aaron, Showtime, RedTie, LB Graph-X, and Highroad Press. 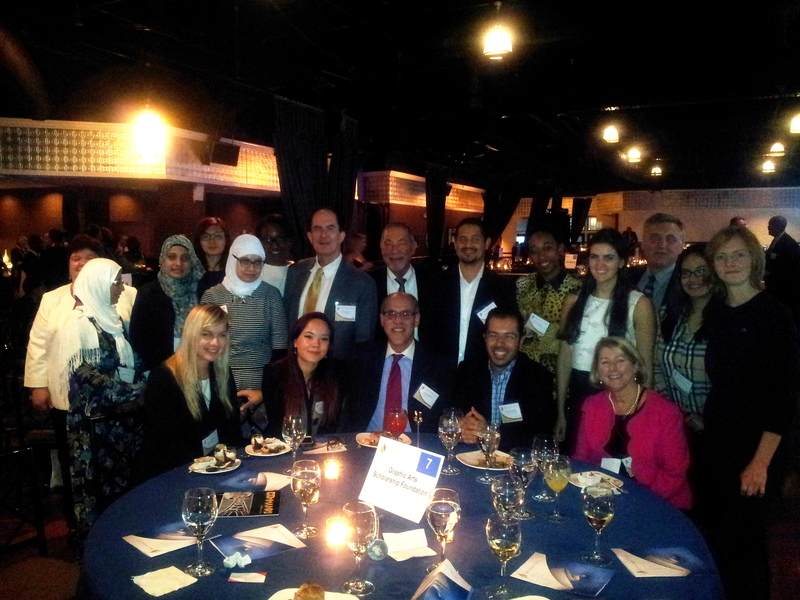 This happy group consists of trustees, students, and supporters of the Graphic Communications Scholarship Foundation (GCSF) enjoying the festivities at the 2015 Franklin Luminaire Awards event at Chelsea Piers 0n October 1. The generosity of sponsors enables students to attend the gala affair free of charge so that they can network with potential employers. Money raised at the event helps GCSF to provide much-needed financial support for New York City metro area students pursuing careers in graphic communications. For a complete description of the evening and its honorees, please see our report at WhatTheyThink. Are you planning to attend the UV LED 2015 conference in Troy, NY, October 28-29? WhatTheyThink, the event’s media partner, is looking for attendees who would like to take part in a panel discussion of the state of UV LED technology and its applications. Printers with UV production experience are welcome, as are specifiers and buyers of UV printing. You don’t need experience with LED (light emitting diode) curing—just a wish to learn more about it and a willingness to talk about where UV LED printing might fit into your future plans. 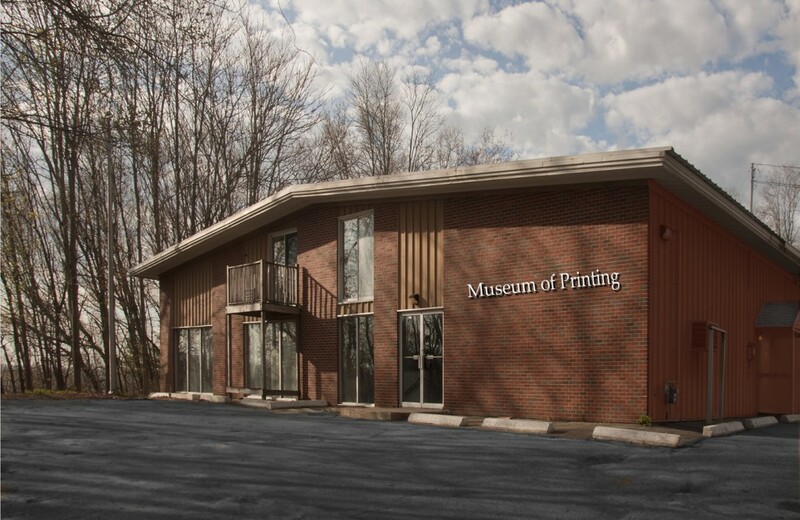 The Museum of Printing, formerly based in North Andover, MA, has announced that it has secured a new site and will soon begin moving its contents there. After 13 years at its current location the museum is moving to Haverhill, MA, along Route 495, north of Boston in the Merrimack Valley. A unique feature of the museum will be that it will house two libraries. One, for general reference, includes typographic books, type specimen books, and specialty publications. The second will be the Romano Graphics Arts Library for scholars and researchers. This collection consists of over 5,000 books, many rare, plus extensive graphic arts ephemera. Part of the Museum’s collections includes the original type drawings used to create US Linotype fonts. The museum will remain open at its current location in North Andover throughout the summer and fall of 2015. The new facility will open in the early summer of 2016. Currently on exhibit is the Lance Hidy retrospective, the Anna Hogan wood cuts, and a collection of Mark Fowler prints. A major fundraising program will be inaugurated to upgrade the new facility and tailor it to the Museum’s needs. The Museum of Printing preserves the past of printing for future generations to understand the impact of printing on today’s world. Showcasing a large collection of letterpress tools and presses, the museum is also the proud home to the only collection of historic phototypesetting systems in the world. The 25,000-sq.-ft. museum is also home to one of the largest collections of print-related books, ephemera, and typeface art. The museum contains two 90′ galleries, a large lobby, a library, and access to the library’s four floors of archival stacks, making it an ideal educational field-trip destination for local school systems. For more information, visit www.museumofprinting.org. Higher education is expensive, and as most students discover, finding the money to pay for it can turn into a preoccupation. That’s why scholarship funds exist: to take away some of the financial pressure so that the focal point of students’ lives can be their academic pursuits, not anxiety about tuition bills. The Graphic Communication Scholarship, Award and Career Advancement Foundation (GCSF) has been providing this kind of philanthropic relief for 13 years, and on June 18, the group disbursed a record amount of it to metro area students enrolled in or about to enter college-level graphic studies programs. 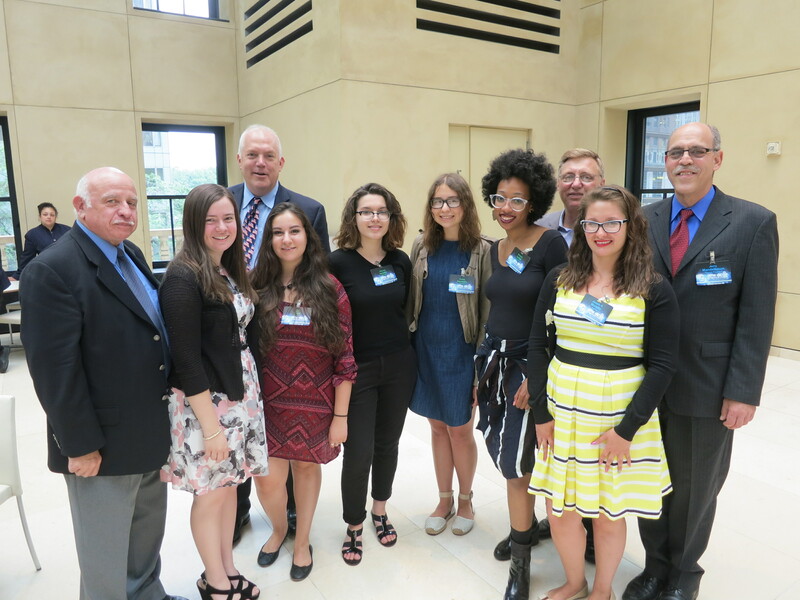 The awards ceremony at the Hearst Tower in Manhattan saw the presentation of more than $100,000 worth of stipends to 31 recipients, the largest distribution that GCSF has made since its founding in 2002. The money consisted of grants from 20 individual scholarship funds coordinated by GCSF, a 501(c)3 corporation that acts as an umbrella organization for the financial support of graphics education in the metro area. Ten of the scholarships were provided by the Advertising Production Club of New York (APC-NY). The rest were grants from industry groups and clubs or funds named in memory of prominent industry figures. To date, GCSF has presented $526,000 in scholarships to 131 students attaining academic degrees in graphic arts, design, production, and related subjects at some of the nation’s most prestigious colleges and universities for these disciplines. Students in undergraduate and graduate programs can apply for grants, and many have received more than one stipend during their time in school. Unique among printing industry scholarship funds in being established and operated entirely by uncompensated volunteers, GCSF does all of its own fundraising and manages its business affairs without an external support staff. One hundred percent of the money it collects is given to metro area students—there are no deductions for overhead or administrative expenses. Its selection committee determines eligibility for scholarships by evaluating applicants’ SAT scores, grade point averages, portfolios, and other criteria. GCSF also offers a student mentoring program and sponsors fundraising social events like the June 4 “Spring Fling” at Ogilvy & Mather. 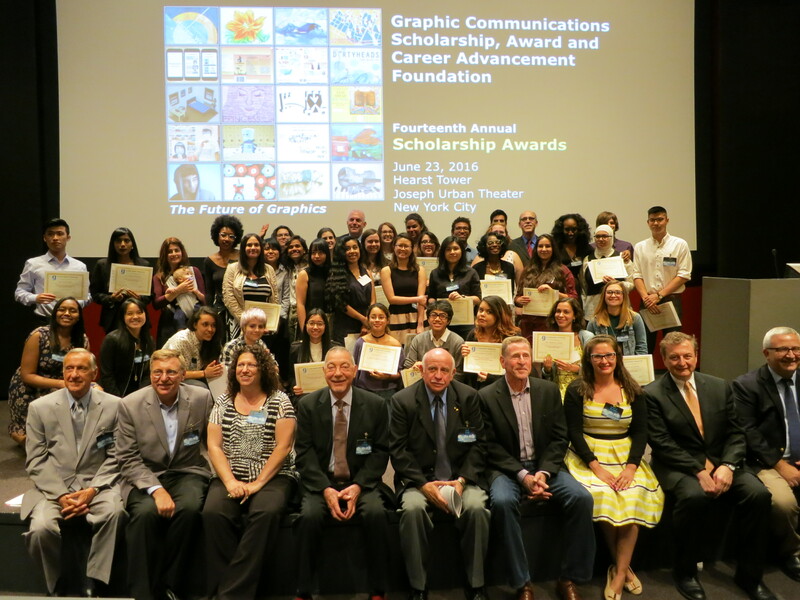 Besides saluting recipients, GCSF’s annual scholarship awards ceremony celebrates graphic communications as a whole and the aspirations it nurtures. On June 18, student speakers Valerie Buonaiuto and Annie Wong shared their feelings about what being able to enter the field meant to them. “Graphic arts is my healthy obsession,” said Buonaiuto, a Bayside High School graduate who is on her way to Adelphi University. Wong, who said she was the first member of her immediate family to attend college, sees graphic design as a “visual means of solving problems” that she is tackling in her studies at Rochester Institute of Technology. Keynote speaker Cheryl Kahanec (EarthColor), a leading expert in digital print production, told the students that printing “is no longer just about putting ink on paper—it’s about delivering messages” in concert with other graphic media. She said that the scholarship recipients were fortunate to be entering the industry at an exciting time, and she thanked the volunteers of GCSF for helping to make this possible. “They believe in you students and your futures,” Kahanec said. Tributes to absent friends were paid in the form of newly created memorial scholarships in the names of Stephen D. Server and Nina Wintringham. Server was a co-founder of the company that became Applied Graphics Technologies, which at one time was the world’s largest provider of publication prepress services. Wintringham is well remembered as a leader of graphics industry organizations and as an organizer of many of their most important activities. Diane Romano (HudsonYards), GCSF second vice president, characterized Server as a “disciple of continuous improvement” whose innovations in electronic and digital prepress helped to transform magazine production. “He would be so thrilled to know his name is on a scholarship,” she said. “Always be serious about your work. “Never be content to give less than the best quality you are capable of delivering. GCSF’s current slate of officers includes Jerry Mandelbaum, president; Ellen Hurwitch, first vice president; Diane Romano, second vice president; Steve Kennedy, treasurer; and Nick Patrissi, secretary. The foundation’s trustees are John Aaron, Mark Darlow, William Dirzulaitis, Vincent Forgione, David Garcia, Jack Kott, Richard Krassner, David Luke (also GCSF’s immediate past president), Jessie Ann Murphy, Linda Nahum, Jack Powers, Laura Reid, and Howard Weinstein. GCSF enjoys the support of numerous individual and corporate donors. To become one of them, e-mail Jerry Mandelbaum. By late May and early June, classes at most metro area schools are over—but the graphics industry’s efforts in support of education are just shifting into high gear. Two recent social events in New York City reaffirmed that the industry’s commitment to students of graphic communications is as strong as ever and that members of the industry enjoy showing their support in one another’s good company. One event has long been a fixture on the industry’s convivial calendar, and the other is new. On May 28, as it has in nearly every year since 1956, the Gamma Chapter of the Gamma Epsilon Tau graphic arts honor society inducted new student members and presented Gamma Gold Key Awards to industry figures whose careers exemplify the values of education. June 4 brought several hundred revelers to the New York headquarters of Ogilvy & Mather for a “Spring Fling” on behalf of the Graphic Communications Scholarship, Award and Career Advancement Foundation (GCSF), a group with a track record as imposing as its name in raising money for metro area graphics students preparing for careers in the field. This party, being held for the first time, heralded the upcoming GCSF event on June 18 at which students either attending or bound for colleges with graphic studies programs will receive their stipends for 2015. The highlight of the May 28 gathering at the 101 Club in midtown Manhattan was the addition of Timothy Freeman and Kathy Sandler to the long and distinguished list of Gamma Gold Key Award recipients. 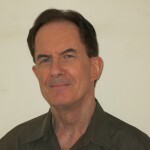 Freeman, a professional trade association executive, has been connected with the printing industry since 1984. He is the person primarily responsible for preserving and strengthening Printing Industries Alliance, the membership organization that unites printing companies and related businesses in New York State, northern New Jersey, and northwestern Pennsylvania. Sandler’s 30-year career in magazine and book production technology epitomizes many of the most important advancements in those fields. She has held senior management positions at top publishing houses and has been a leader of most of the publishing industry’s principal trade groups for production professionals. After the award presentations to Freeman and Sandler, a candlelight induction ceremony brought three more students into Gamma Chapter’s august ranks. This honor society aims to instill values that drive professional success and inspire a career-long commitment to supporting and serving the graphic arts industry. 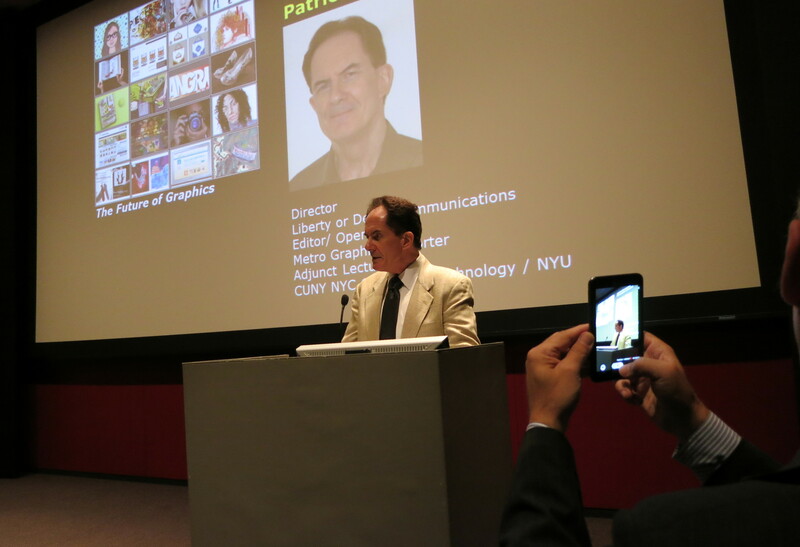 Besides saluting students and industry leaders, the Gamma Gold Key Awards program also spotlights the role of New York City College of Technology (City Tech) as a leading center of graphics education for the metro region. Gamma Epsilon Tau’s Chapter’s Gamma Chapter is located there as an activity within the Department of Communication Design (COMD), an undergraduate program that has been training people for careers in graphics for more than 60 years. The department, formerly focused on advertising design and traditional graphic arts manufacturing, has broadened its academic scope to include curricula in new and emerging forms of visual communications. It now offers associate and bachelor’s degree programs that enable students to specialize in advertising, graphic, web, and broadcast design or gaming, animation, and illustration. Chaired by MaryAnn Biehl, who gave an update during the Gamma Gold Key Awards program, the department currently enrolls about 1,000 students from throughout the metro area. It recently completed a two-year self-study exercise that will lead to an important academic accreditation from the National Association of Schools of Art and Design (NASAD). A new curriculum in communication design management is to be launched in the fall semester. At a later date, the department will relocate to an expanded media center being developed in refurbished space at City Tech’s downtown Brooklyn campus. Students from City Tech have always been among the recipients of GCSF scholarships, as have students from other, equally prestigious colleges and universities offering undergraduate and graduate programs in graphic communications. The foundation has presented $526,000 to 131 students since it began collecting money in 2002, and on June 18, the value of the stipends will be the richest yet: $110,000 for 31 students who will assemble with their families at the Hearst Tower to become the latest beneficiaries of one of the most exceptional fundraising efforts anywhere in the industry. The June 4 “Spring Fling” at Ogilvy’s space on the far West Side wasn’t entirely without precedent—GCSF held a “holiday bash” along similar fundraising lines at The Art Directors Club last December. 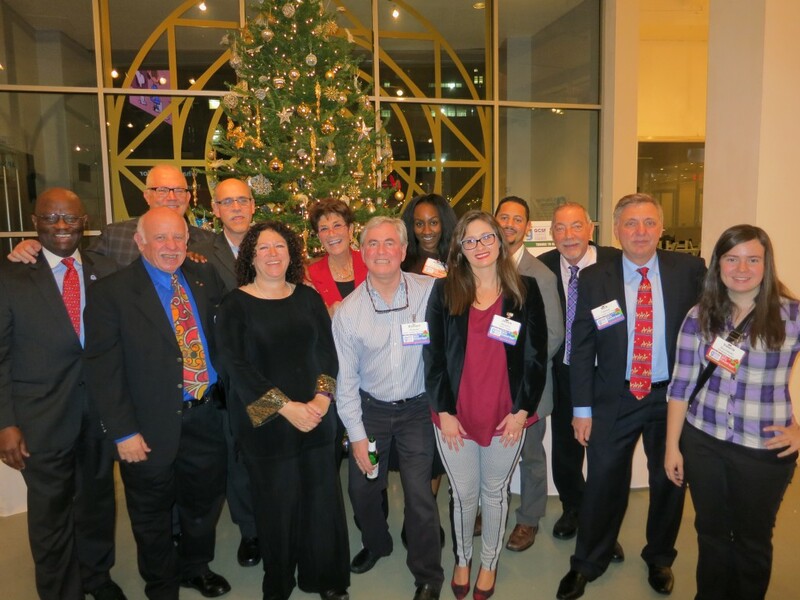 Like that festivity, the “Spring Fling” was all about raising awareness of the need for more donations, more involvement, and more activism on behalf of industry education. The foundation, a 501(c)3 corporation that operates entirely through the work of volunteers, has become a focal point for education in the metro region and is actively supported by other industry groups that share its aims. For example, 10 of the grants to be presented on June 18 are funded through a sponsorship donation from the Advertising Production Club of New York (APC-NY). At the “Spring Fling,” GSCF booster Diane Romano announced that proceeds from the October 1 Franklin Luminaire Awards event (a joint production of Printing Industries Alliance and IDEAlliance) would be donated to the scholarship fund. GCSF also has a growing list of corporate supporters that contribute cash, gifts for scholarship recipients, mentoring assistance, and other kinds of help. On June 4, representatives of these companies mingled with a cross-section of publishers, advertising and media professionals, creatives, print service providers, and industry technologists for what was both a sophisticated cocktail party and a pride-inducing show of the industry’s determination to take good care of its youngest, best, and brightest in the metro area. 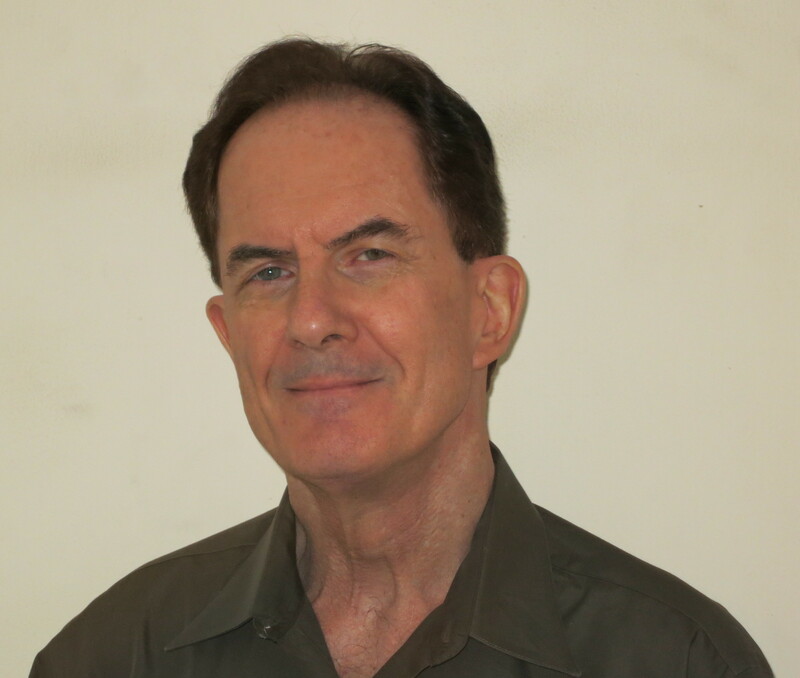 The Graphic Communications Scholarship, Award and Career Advancement Foundation (GCSF) will present its 2015 Champion of Education Award to Patrick Henry, a longtime journalist and educator in the field. 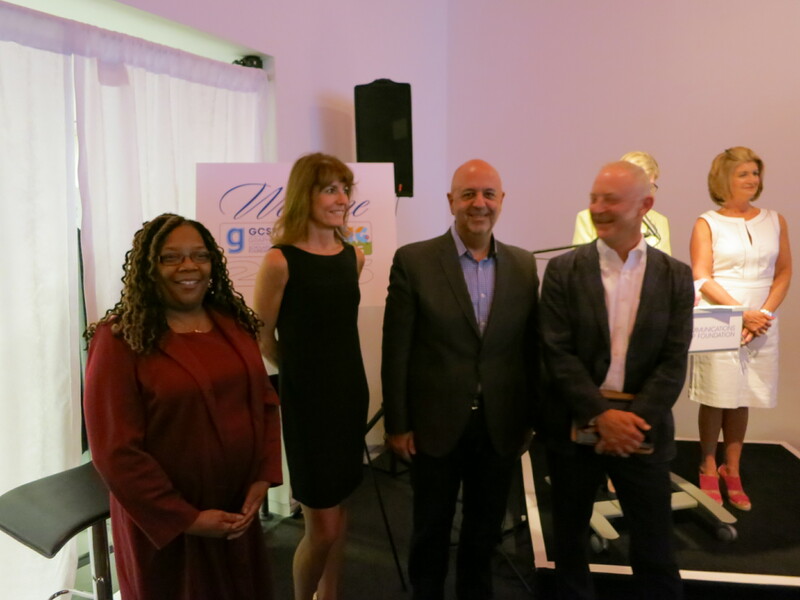 Part of GCSF’s 13th Annual Scholarship Awards Celebration on Thursday, June 18, in New York City, the Champion of Education Award honors exceptional individuals who have helped to prepare the industry’s next generation of talent and leadership. Henry began covering the graphic communications industry during the desktop publishing revolution in 1984, when he became managing editor of Printing News. Since then, as an editor of or a contributor to most of the industry’s leading trade media, he has published many hundreds of articles on business trends and technological developments in graphic communications. He is a co-author of a textbook, The Magazine Publishing Industry. He also wrote the chapter on book manufacturing for Volume 5 of A History of the Book in America. An adjunct lecturer in graphic communications for master’s degree programs at New York University since 1987, Henry also has taught undergraduates at New York City College of Technology. 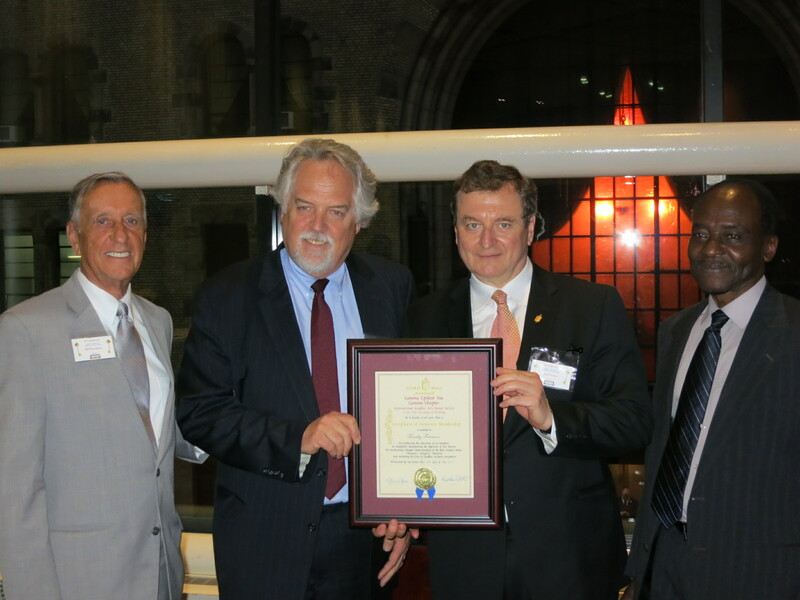 He is the recipient of numerous honors for industry service and education, including the Florence B. and Leo H. Joachim Award; the Gamma Epsilon Tau Gold Key Award; and the Tom McMillan Award for Journalistic Excellence. Henry currently is an editorial manager for WhatTheyThink. He also operates Metro Graphics Reporter, a news resource for the graphics industry in the NY-NJ-CT metropolitan region. The award to Henry will be among the highlights of “The Future of Graphics,” a special program paying tribute to the latest recipients of GCSF scholarship grants. 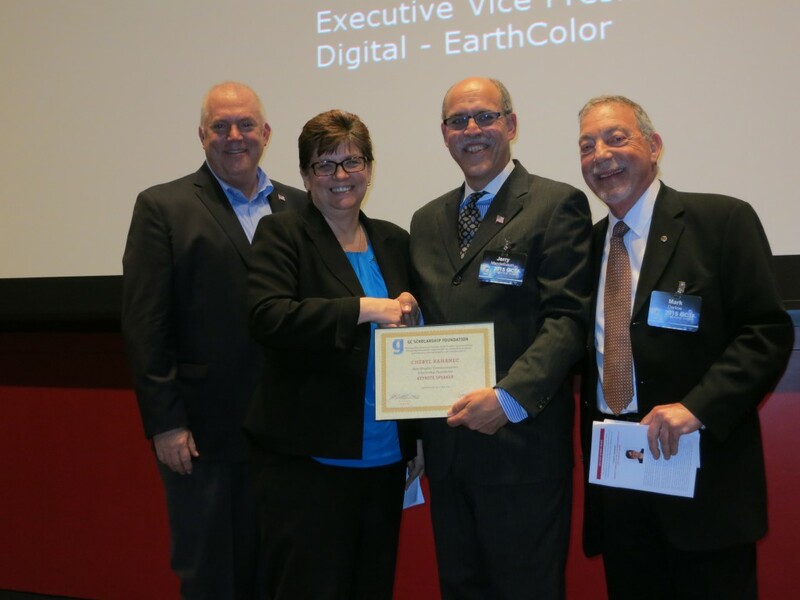 The keynote address will be delivered by Cheryl Kahanec (Earthcolor), a leading authority on digital print production. The event also will feature the inaugural presentations of scholarships in memory of industry figures Steve Server and Nina Wintringham. GCSF’s 13th Annual Scholarship Awards will take place at 5:30 p.m. on Thursday, June 19 in the 3rd-floor Atrium and Joseph Urban Theatre of the Hearst Tower, 300 W. 57th Street in Manhattan. Admission is free, but all attendees must pre-register by e-mailing a request for entry to Jerry Mandelbaum at jmandelbaum@601west.com. The Graphic Communications Scholarship, Award and Career Advancement Foundation is an all-volunteer, 501(c)3 non-profit organization that provides financial support to New York City metro area students pursuing careers in graphic communications. Since its founding in 2002, GCSF has given more than $500,000 in stipends to 131 students in graphic studies degree programs at leading institutions in the field. This year, 31 students will receive scholarship awards totaling $110,000, a significant increase in GCSF’s annual awards amount. Of the 31, 10 are being funded through a sponsorship donation from the Advertising Production Club of New York (APC-NY). On June 5, more than 100 students from 10 New York City high schools will assemble at New York City College of Technology (City Tech) in downtown Brooklyn for the metro area’s most important showcase of young talent in graphic communications: the 14th Annual Citywide Graphic Arts Competition. The event, held under the auspices of the New York City Department of Education, challenges the contestants to conceive and execute their best work in seven categories on a tight, real-world production deadline. The judges are graphics educators and industry professionals. The awards include trophies, cash, gifts, and, for the first-place winners, a celebratory dinner and a tour of The New York Times plant in College Point, Queens. The judging categories are for graphic, package, and web site design; photography; student filmmakers; digital video production; and digital illustration. On June 5, the contestants will have just four hours to research, design, and produce their projects on site for evaluation later in the day by the judges. While they work, the teachers who encouraged them to enter will attend briefings on industry trends and career paths for students of graphic communications. The competition is open to all New York City public high school students participating in a graphic arts program. This year, entrants qualified as first-round and second-round finalists by pre-submitting work on the theme of “My City” for online judging by high school graphics teachers. The teachers used detailed rubrics based on professional standards of the graphics industry to assess the entries. The finalists will receive new assignments to develop for the prize competition in the Atrium at City Tech, which is located at 300 Jay Street. This year, for the first time, alumni of the competition—graduates who were once finalists themselves— will award the trophies, cash and prizes to the winners. Organizing and promoting the event is Graphics Industry Advisory Commission, a group of volunteers who work with the Department of Education to improve study programs in graphic communications at city high schools. The commission is one of a number of advisory groups under the umbrella of the department’s Office of Postsecondary Readiness (OSPR), which fosters public-private alliances in support of career-focused education. Donors can call Bensen at 917-359-7569 or e-mail her at angen@comcast.net. The competition also has a PayPal link for those who wish to contribute online.